When my own children were little one of their favorite Easter activities was egg hunting. One Easter I left a trail of clues all over the house and garden. My two girls had an amazing time reading the clues and searching out the eggs. 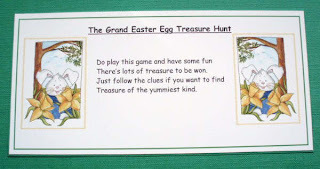 It was remembering those happy days that led me to designing this fun activity that I hope you will like and perhaps make to use with your own children or grandchildren this Easter. 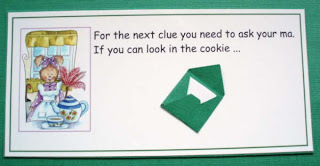 Clip art, rubber stamps, die cuts or other suitable materials to decorate your clue cards. Small envelope die, punch or template. I don’t think I need to go into great detail on how to make these cards as I’m sure you’ll agree that the pictures are self explanatory. 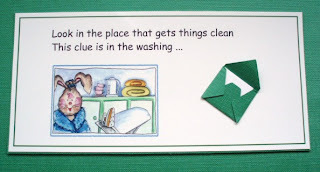 To create my game I used the new Messy Rabbit CD by Joanna Sheen. I chose a different rabbit image for each of the cards and added a rhyming clue. I printed these out and made small envelopes using my Cricut machine to attach to the front. Inside each envelope I put a little card containing the answer to the clue. 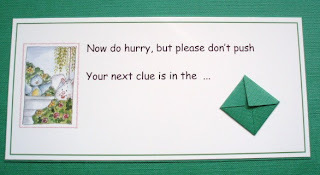 You may want to only do the text on your clue cards and then use your rubber stamps or maybe die cuts to decorate and pretty the cards up later. The choice is yours. Do make sure that if you are using die cuts or rubber stamps that you plan the size of your card or text before printing so that both the images and text fit on the card properly. As a teacher I am always aware of the educational potential of any games I make. 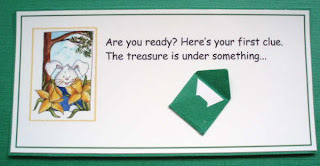 This Treasure Hunt is an ideal opportunity to encourage early readers to practise their reading skills. In the early stages of learning to read picture clues play an important part in helping to decipher the printed word. The images taken from the Joanna Sheen CD are perfect to encourage children to develop this skill. 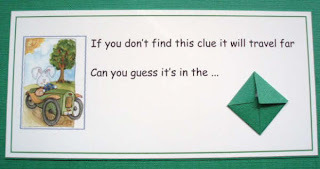 If you are able to use these images or similar do take the opportunity to talk about the picture and guide your child in using it to help them to work out the location of the next clue. 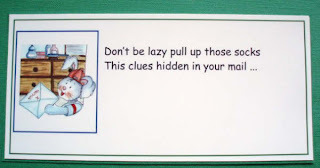 Each of the clues in the game are rhyming couplets. Rhymes are a great way to encourage and give children practice in focussing on the sounds in words.. It may be that you have one child old enough to read the cards and perhaps a younger child who will enjoy the sound of the words and be able to guess (using the rhyme and picture as clues) the answer. Some of the card ideas given here might not be suitable for your home or perhaps the weather might make it impossible to go outside. Do use the rhymes that you like and have a go at making up others that fit your home better. It would be really great if you do create some of your own rhyming clues if you could leave a comment here sharing them with us. We would love to hear them. 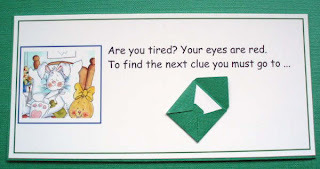 For each clue card I made a little envelope with the answer inside and attached it to the front. 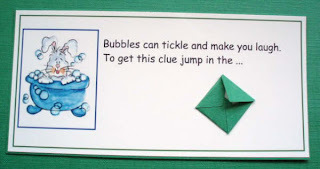 These add to the fun of the game, but also if you have a very young child who can’t work out the clues opening the envelope keeps them involved. A couple of small eggs placed alongside some of the clues may be a good idea. They will add to the fun and also make the game last longer. I’ve only done a few cards to give you some ideas. Obviously you can make as many cards as you like. I know my children didn’t want to stop when they played all those years ago and it is surprising how fast they find those eggs and clues. Don’t forget if you do make some rhymes please add them to our comments - the more rhymes we have the better the game for all of us. this is such a cute game! I think I might do this for my girls for Easter! Thanks for the idea! I am excited to do this now!!! Fabulous Tutorial Ann!! Love it!! I am with Robin...My kids would get a kick out of this!! "You're almost to the final treat! Your next clue is where you brush your teeth..."
you'll find your next clue in your favorite bedtime book." "I'm so proud of you! You make a great Easter bunny. Okay, I'll stop!! Or this post will be a page long. haha! Now I'll get busy and start planning my own egg hunt. Thank you so much for the inspiring ideas! Great idea Ann! 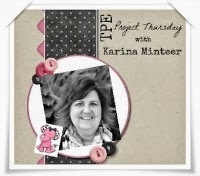 LOVE the fun idea and what a great tutorial! 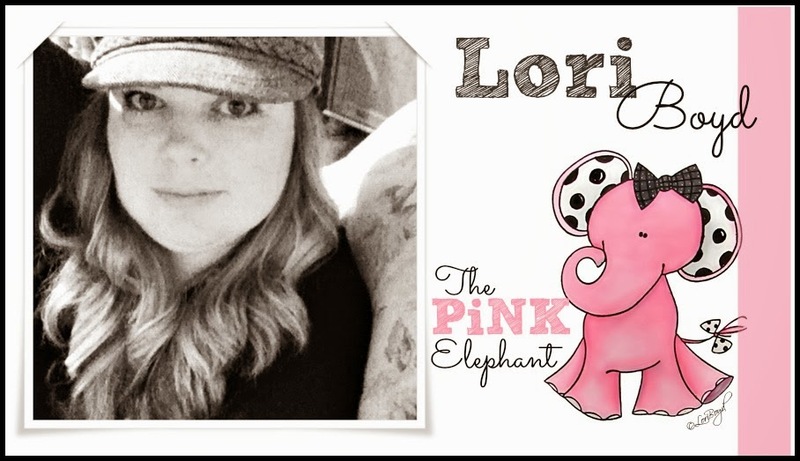 Wow Joni, these are Awesome!!! Really cute!! You are a rhyming genius!! It must have been great to be in your class Ann, this is wonderful! your own horn you should toot! fabulous hunt :-) will remember this for the grandchildren ha ha , not that any are expected any time soon !!! what a fantastic idea for children - when i become a grandmother i will definitely have so much fun with this ! take a look in a boot. You must find it, thats the task! Is it here? Is it there ? You must look everywhere !! When I find it must I share ? Well you can take it, IF you dare !! AW what a cute game. I just wish I had kids....oh hopefully soon! Thanks for the fun weekend. It's been a blast! What a FABULOUS idea!! These are soooo cute!! and a clue you will find. And then look under there. look where the postman leaves the letters. your next clue is hidden in the apple... (trees)"
I started doing egg hunts 20 years ago, when my son was 5. It's become a tradition in our house now and I'm still doing them. Only trouble is my youngest daughter is almost 19, and the boyfriends and girlfriends join in too! What a great idea though to use Messy Rabbit. You'll find your next clue up on top. Some fabulous rhymes there ... well done! I have a feeling there's going to be lots of 'littlies' across the globe scouring houses and gardens for clues this coming Easter.